The oldest surviving part of the cathedral is the Romanesque church, which dates back to the 9th century according to latest archeological research. 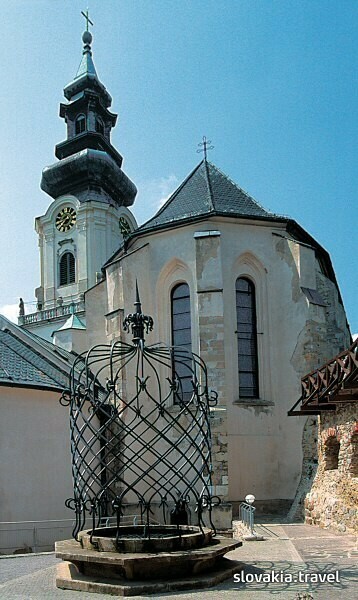 It was rebuilt after fire in the second half of the 13th century and after Matúš Čáks soldiers destroyed it, a new Gothic church was built next to it in 1317. From then it served as what is called the ”trustworthy” place of chapter and later as the treasury of the cathedral. Today, it forms together with the Upper and Lower Churches the most valuable structure in the area of the Castle - the bishops Cathedral, the Basilica of St. Emeram. The originally Gothic Upper Church was built in the years 1333-1335 and three centuries later the Lower Church was added to it. A wide staircase connects both of them. The appearance of the cathedral as we know it now is from the years 1710-1736 and its interior is also from that time. Among the most valuable monuments of the interior is the main altar of the Lower Church made by the Austrian sculptor J. Pernegger who used the painting of D. Voltera as a model. In the years 2007-2013, the cathedral is undergoing general renovation under the patronage of Nitra’s bishop Mons. Viliam Judák, so it will be ready for the 1150th anniversary of the arrival of St. Cyril and Method to the Great Moravia (863). For this reason, access to certain parts of the cathedral may be restricted. Prestávka od 12:00 do 13:00 hod.